:D :D :D :D :D :D !! 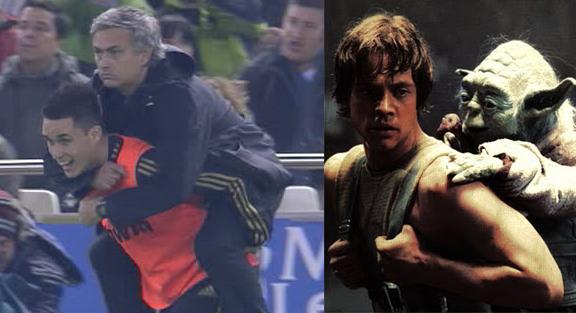 He’s the Yoda of the footballing world. OMG Mr. Sparkles you don’t realize how right you are. When you said that I remembered Mourinho’s speech on eggs and omelets. He deserve this, he is special nd wil alwys be special….the world loves him, he is a trend setter, modeller, entertainer nd tactician, MOURINHO is the best…. Was the fist shake pre-programmed by both men?? Yes that’s the specail one. Bravo!! Bravo!! Bravo! REAL. Josee is the right man for Real Madrid as he entertained the supporters when the world is super star scored the winning goal the separated the two teams.i think RONALDO should be treated like ababy forthe job well done.the whole team has played a great roles that night. If Mou will get all the prices this year, he will leave Real Madrid for sure. And that is his weird mentality. On the other side if he won’t he will be kick’n out by Real Madrid. @ solo…..who’s being hypocritical and jealous minded? sounds like your typical real madrid wannabe fan mentality of always being persecuted because of any thought that isn’t oh HALA MADRID or Mourinho is the best or any other jerk-off sayings. Frankie says RELAX and enjoy what little you have to be happy in your pathetic life. Oh….great game by the way. higuain saved your asses.